I’m new to airbrushing. The praise Carl of The Independent Characters fame heaped on the technique, plus hitting an absolute wall with my usual techniques trying to paint yellow encouraged me to take the plunge. Badger Airbrush Co. was at the Las Vegas Open last year, and they had a spectacular deal on a starter set: a Patriot 105 airbrush, a tanked compressor and their entire line of miniature wargaming specific Minitaire paints for…a substantial discount. 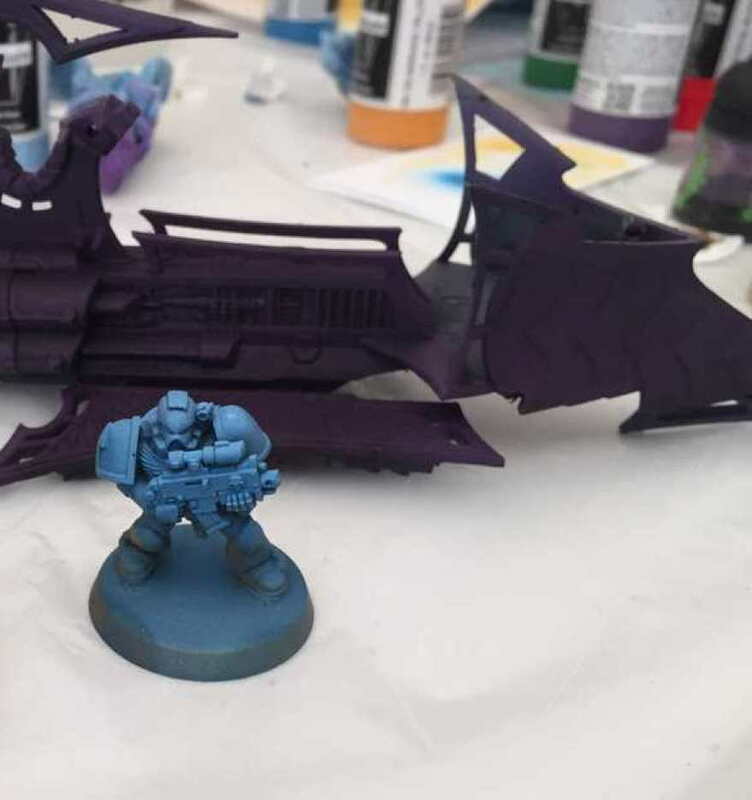 So…how are the paints, from the perspective of an admitted beginner? This is going to be a more narrative review than some of my others, because it’s very much just talking about my experiences. First up, the physical product. The bottles are 1oz (~33 ml) bottles with flip-top lids but no “dropper” like a Vallejo paint bottle. I actually prefer this – I’ve found that the droppers get a bit messy, and I’ve had no problem getting the paint out. And conveniently, if you way overshoot the amount that should be going into your brush, it’s far easier to pour some back in. In terms of product availability, none of the stores near me carry the stuff, but they appear to be widely available on Amazon.com directly from Badger, and with Prime shipping. That’s nice. The full set is 84 bottles, which comes to about $2.13 per bottle, which is a nice discount. There’s also 2oz bottles on Amazon for ~ $8 each. The Good: I’m a fan of these paints. Everything I’ve used works straight out of the bottle without thinning, with very few issues. Colors go on well, they don’t obscure any detail, and basically they did as they were expected to while being sprayed by a total newbie. That’s nice – there’s already enough hazards to learning to airbrush without “and also your paints hate you…” added to the mix. They also work fine with a brush, for quick touch-ups, color consistency, etc. I’m going to particularly call out their ranges of blues and grays. They’re both great – there are a huge amount of blues ranging from some deep, rich colors to “Power Sword Blue”, with clear steps between them, and no really strange shifts in the range. Their grays are the same – everything from “Nearly Black” to a pretty pale, almost plastic sprue gray comes in the kit. 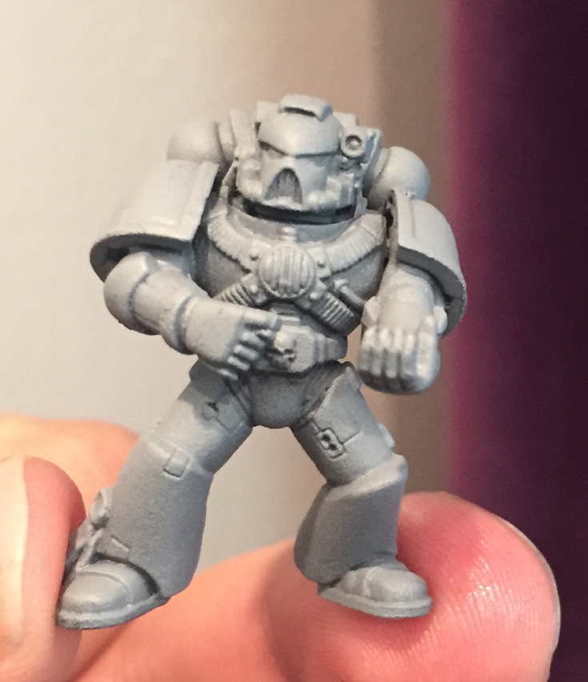 I actually managed to recreate “Unpainted Grey” which will come in handy if I ever actually make my “Da Grey Tide” Novelty Ork Army. Their reds and greens look promising as well, though I’ve had less experience with them. I believe their “Demonic Skin” color is also the closest thing I’ve found to Naggaroth Night so far, which is conspicuously absent from Citadel’s airbrush line. Their “Ghost Tint” range also worked as advertised – essentially, these are a glossy, semi-transparent “stain” to apply over a model that can result in some really vibrant, eye-popping schemes. Your mileage on these may vary though – they’re not magic. I had great success with creating a deep, rich purple, but the golden yellow ends up looking obviously airbrushed despite several attempts. The effect they create also changes dramatically when you knock down their inherently glossy finish with a sealant. The Bad: No paint line is perfect, and Minitaire is no exception to this. I’m sure there are other issues (I haven’t even touched the metallics yet, for example), but there’s two I’ve run into. 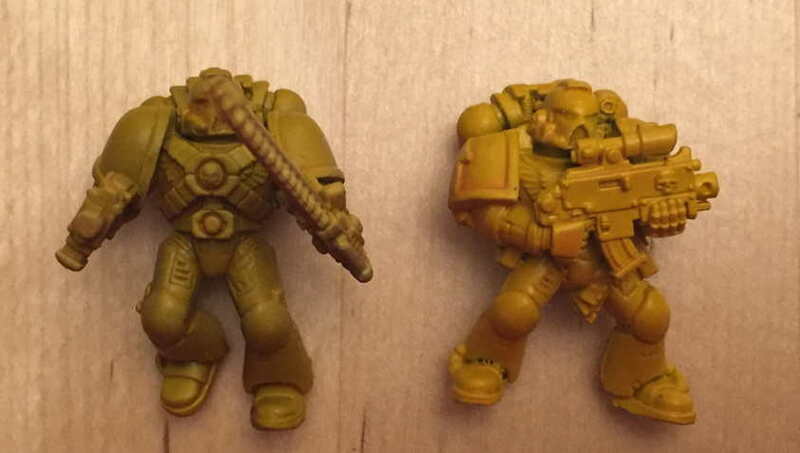 The first is their yellow range – important to me as I’m working on the Imperial Fists. Unlike their blues and grays, I’m not at all impressed with their yellows. They tend to bounce between “Orange”, “Eye Searing” and “Tepid”, with nothing in between. Like they are accent colors for hazard stripes and the like without being a standalone range. Consider the image below, with a Minitaire painted figure on the left, and a Vallejo on the right. Regardless of whether you actually like this scheme or not, they were both attempts to get the same look, and the difference is pretty stark. The other issue I had was with the flat varnish, as I figured I’d save myself some time and skip using my trusty Krylon matte sealant. To be frank, it was an utter failure. Despite being mixed pretty carefully, and allowed to dry for quite some time, it was undeniably glossy. I ended up having to hit them again with Krylon anyway, defeating the entire purpose. Overall? I’d give the range a 7/10 – it’s good, but it’s not great. The full set is perfect for having “something that will probably suit” for most occasions, though you will probably need to supplement with other paint lines for some colors. The product itself is nice, and lovely to work with…as long as you don’t need a flat clear-coat. Great article. I am not a huge fan of the minitaire paints – though I do like the ghost tints. In general I use the Vallejo Air line the most. The yellow comparison is a great one you gave.